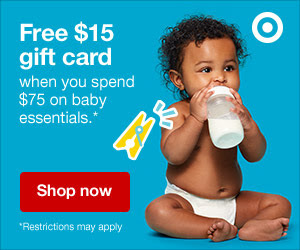 Baby products, baby products! There are so many. I could buy McCoy new treats every week if I let myself. But for the most part, at nine months, you don’t need a ton. At three months, I felt like I needed so many things to make our lives functional. Now though? He’s happy with sleep, milk and a few toys. It’s such a fun age! Woolino Sleep Sack // We’ve been using this since we transitioned out of the swaddle at nine weeks. It is, quite possibly, my favorite thing he owns. He loves it! It’s expensive, but if you think about the fact that he will wear it every night until he’s (probably!) two, plus for naps, that’s more than 1,500 wears! We have backup sleep sacks for blow outs, laundry, etc. This one is just the best. Melissa & Doug Geometric Stacker // A few weeks ago, we were at my sister-in-law’s house. Mac was SO into my niece’s toys. I realized then that he was still playing with baby toys and it was time to get him some nine to 12 monthers. He’s so grown up now, you know? He LOVES this toy. He plays with it every morning and afternoon. Avanchy Bamboo Plate & Bowl // I love this set! McCoy loves to feed himself, which means he wants to pull the bowls and plates off the table. I love that these suction down! We have the spoons and forks, too. They’re the perfect size and great for when he’s teething, too. Joss & Main Quincy Swivel Chair // This was a big purchase last month after I sold the original Target rocker we bought. I just didn’t like it. I found this one on sale and fell in love. It is making his room oh-so happy. I love swiveling in it. It’s a more natural motion than rocking for me. I don’t love the look of gliders, so this felt like a great alternative. Boon Bath Boats // Baby boy loves Boon Boats in the bath (try that tongue twister!). But seriously, he loves the bath and he loves the boats! At three months, here are our favorite products. 1. Woolino Baby Sleep Sack // We transitioned him from the swaddle to the sleep sack when he moved to his crib. He was kicking out of the swaddle so much that he had scrapes on the back of his legs. He loves this sleep sack! It's made for four-seasons and should last until he's two. It is worth every penny! 2. Motorola Baby Monitor // I never thought we'd transition him to his crib so soon, but he was ready by 9 weeks. When we did it, I cried standing over his empty bassinet in our room. Then I cried thinking about someday taking him to college and standing over his empty bed in his room. But, I digress. I use this monitor to stalk him while he sleeps :) The picture is so clear. I love it. 3. Little Unicorn Crib Sheets // I absolutely love these sheets. They're so pretty, soft and wash well. We have a changing pad cover from them, too, and love it. It has pots on it. It's happy. 4. bumGenius freetime diapers // I didn't start cloth diapers until Mac was sleeping through the night. As my sister said: when you aren't sleeping, there's no need to be doing extra laundry. We absolutely love them! They're so cute, easy to use and not a pain to wash. I think he's sleeping better at night in them, too. 5. Qeepsake // This app is amazing. It texts you one question about your baby each day. You answer + add a photo. You can print it any time. It's a textable baby book! It is wonderful. I have the Emily Ley baby book, which I love. But it's so nice to have daily thoughts captured - the little things that you might not think to write down. It is such an easy way to watch them grow and change. I love scrolling through the old posts and can't wait to print it. 7. Caterpillar & Friends Play Gym // Let me be honest: I almost didn't register for this because I wanted the much-more-muted Anthropologie version. It fit my home motif a bit more! But my sister convinced me to register for this and I'm so glad she did. McCoy LOVES it. He just laughs and smiles as he stares at it. It's his favorite time of day. Sure it's more colorful than I'd select for my living room, but it's worth it for how much he loves it. 8. BOB Jogging Stroller // Absolutely love, love this stroller. 9. BABYBJORN Bouncer // McCoy loves to play in this bouncer! It's the perfect activity to help stretch him when he's not ready for a nap yet, but getting sleepy. 10. Netflix // :) You spend a lot more time at home once your baby has a bedtime. I'm thankful for good shows, a comfy couch and Halo Top ice cream! It’s 3 a.m. and we’re on the front porch. The humid air presses against my skin like a thick cloth as I sway under the light of the moon. McCoy is crying in my arms as I sing to him - any song I can think of as we cycle through them quickly. I never know the words but he doesn’t seem to mind. I start with the Wheels on the Bus, then transition the Vitamin C’s Graduation song and Sufjan Stevens' one about driving to Chicago. I haven’t heard any of these songs in years. Why are they coming into my head now as I soothe my crying baby? And why don’t I remember any lullabies? I make a mental note to listen to a few on Spotify tomorrow, though I'll most certainly forget by morning. Chris takes a turn at burping him now. We’ve decided he’s the better burper. Good job buddy! We both tell McCoy as he gets one out. His aching stomach has been bugging him for weeks, making sleep impossible some nights. Any air released feels like a victory for the whole family. He's five weeks old now and everyone keeps telling us his gas should get better by week six. I hope they're right, because watching his little back arch as he writhes in pain makes me want to sob. I take him back and rock and rock and rock, trying different positions and - very inappropriately - transitioning to we will We Will Rock You by Queen. I stop when I get to the part about having blood on your face. It just doesn't feel like the right sentiment to soothe a crying baby. Just when I think we will never get him to sleep, his eyes begun to flutter. They’re heavy now as his crying slows. His eyes bat up and down one last time and his entire body relaxes. His breathing steadies now as he nestles his soft cheek into my neck. I suddenly miss him and miss this moment. As he begins to grunt Chris and I make eye contact: he’s asleep. We did it! We walk slowly back into the house, avoiding the creaky parts of our old wood floors. I place him into his bassinet and watch his body shift. It is so clearly by Divine design that even after an hour of screaming, his face is still the most pleasing thing I have ever seen. We fall into bed. Exhausted. Grateful. Everyone says these days go quickly. At three weeks I thought everyone was lying. The days felt long and the nights were terrifying. But here we are at five weeks and my heart breaks at photos of him from those first 20 days. I’d be lying if I said I didn’t already think about the day we will drop him off at college or what his wife will be like. I pray - though it’s more like begging - for a lifetime with him. I couldn't imagine the earth without him in it. He is perfect to me. I watch his chest rise and fall and listen to him snore. Chris is asleep next to me. I’m positioned between the two most important men in my life, flanked by their soft sleepy breathing. I wonder then how it’s possible to miss a moment before it’s even gone. To miss the way you felt, the sounds and the smell, when you’re still inside of them. I suppose this is parenthood. One moment you’re gritting your teeth, praying you can outlast your child. And the next you’re on your knees, praying for time to slow down, wishing you could bottle it up to drink later in life. Two Weeks of McCoy // baby things I'm loving! McCoy will be two weeks tomorrow and I can hardly believe it. Time has gone so quickly already. I can't believe how much we love him and how much he matters in our lives. How did we not know him only 15 days ago? He is perfection to me! I am going to take a two week break from blogging to really sink into these newborn days. Or, as my 4-year-old niece calls them, born born baby days. I will be back with posts in early June and will resume my regular Monday, Wednesday, Friday schedule. In the meantime, though, I wanted to share a few things I'm loving during the first two weeks of his life. These nursing bras: Originally, I bought a nicer nursing bra. But, here's the deal: you leak on them. You stretch them out. You just need something functional. These are less than $7 each and have been absolutely perfect. These protein balls: Breastfeeding makes you so hungry! Having these on hand in the freezer has been crucial to my 3 p.m. hunger. aden + anais swaddles: These things are really hyped up and I wasn't sure if they'd be as great as people say they are. Oh, but they are! They're the perfect weight and size. He absolutely loves to be swaddled in them. Our Moses basket: If not in my arms, McCoy loves his Moses basket. The striped sides and handles hold his attention when he's awake and it's the perfect way for him to sleep in the living room when I'm getting things done. I highly recommend!